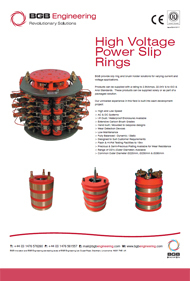 BGB provide slip ring and brush holder solutions for varying current and voltage applications. Products can be supplied with a rating to 2.5KAmps, 22.0KV & to ISO & Ansi Standards. These products can be supplied solely or as part of a packaged solution.